More than a game were two, two and two Madrid Athletic, two worlds that each contestant dignified but the last part is what is and almost always is the Madrid, leader in the Nou Camp and trained team in good times and bad, Christian in front and behind an army. Madrid still winning and still deserves. I said. The party draws a red line on 55 minutes. Until then, the Athletic tute the host and held his eyes as no one had ever done at the Bernabeu. Casillas can attest. The merit of visitors is even greater if we think that the leader, in that stretch, got two goals ahead. Other teams perform so much annoyance as a sign of fate and give up the flag. Athletic, no. Shortened distances and became increasingly important, more lion. In the next few minutes the game was in the air, totally uncertain, isolated from the influence of the stadium and more inclined towards the tie that sentence. Shortly after the break the red line is drawn. At that moment, Susaeta made the mistake of so many strikers who want to help on the defensive. A mistake that is a mortal sin when the play takes place within the area. I’m talking about putting the leg, to supplant the defense, find the contact. The strikers do not know Susaeta measure and not measured. Neither the location or intensity. Was addressed by Di Maria and was seduced by his music caracoles and feints. I am absolutely convinced that he wanted to penalty, but made it absolutely. That his team dismantled. The Athletic had in his script for a penalty of one thousand pages Susaeta. And that went ruminating while Sergio Ramos, pitcher surprise and I suspect that spontaneous, marked the third Madrid and although Llorente pulled the ball from the center, while later. The scenario changed completely. The stadium, with its 80,000 people, regained his place and influence. The leader felt he was and the story went downhill, like so many nights, so driven by instinct and by the depletion of the opposite. In this sense, the fourth goal was relentless. Cristiano intercepted Amorebieta no reason other than frustration and Portuguese did pay cash. His free kick flew with the atoms and the ball revolutionized Iraizoz cheated before getting his gloves, as if inside the ball had a wicked driver. Before Cristiano got the fifth goal, led by another penalty (this time more vulgar, a defense), Athletic deserved the second goal. Basically, not to faint. And the shot should be one that Javi Martinez crashed into the crossbar. The problem is that there was no faith, no strength or courage. You see. Both can change your life in just 55 minutes. Completed the short, stop playing the protagonists and this will continue, as in the big productions, the order of appearance. First, Llorente. Were not completed within two minutes of play when it controlled a ball with the tranquility of a flea-tamer, turned, beat the chicane formed Carvalho and Khedira and shoot on goal, Pepe took the sticks. To get an idea: it was a move worthy of Van Basten, global star. The move caused a stir polysemous. You know how these things: Llorente understood that the Real Madrid wants to come and Athletic supporters interpreted that he wants to stay. The player, meanwhile, insisted in an argument or otherwise. He played every ball within reach, gave a sense, open space, watching, plotting and, meanwhile, grew old Carvalho, who fell out ten years of hit and hit on the eyebrow. The Bernabeu is so sensitive to such displays on home turf one day they signed Munitis for a great night and for some time longed to Adriano, or Litmanen, just as long before it fell in love with Di Stefano or Kubala, heroes of unforgettable nights. I am to ensure that yesterday resumed the sighs of past and ancestors. 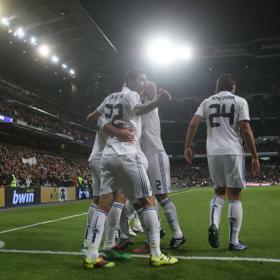 Despite the prominence of Llorente, Higuain scored. So it is almost always. While evoking the glamorous front of handsome, he reminds us of real importance and carnal, four-day beard. This time he did it with a goal that intelligence and girth combined, characteristics that define them. Let’s say you helped so much talent as the culamen, knowing how to protect, hold first and kill later. If football was like the movies, Higuain end up taking the girl and end up surrounded by grandchildren. He deserves it for his tenacity and, in some cases, our contempt, and in this bag include Mourinho, who replaced him again. Llorente continued vanbasteando and Casillas just left him at the gates of glory. At its best intervention, Iker repelled a shot to turn and in the presence of Pepe, giving testimony to the ability of the front and, above all, of its value. The focus changed when Christian actor backlash culminated a manual and put the second goal on the scoreboard. It was a move launched by Higuain and which gave Özil then with a touch of velvet. Christian, caring and an antelope, beat Iraizoz with a left hand underneath, beautiful pure simple. And as so often, the goal calmed genius. Until then, Christian, agitated by the display of Messi, seemed somewhat anxious. Nor does he favor the rigidity of the team, which continues to encounter problems when to attack well-placed defenses. But neither those complaints downgraded. Even when he walked more obtuse, Cristiano came close to score a bicycle kick that would have been worth eight. His uncheck are essential in the deployment of counter attacks, the deadly weapon of Madrid, and his performance does not need close to perfection to score three goals. Another thing is the privilege of enjoying improbable shots to be played for entertainment in protests that will hang from the action or to play everything. The technician should conceal these favors or more, easier, removing them. And so the monotony. At the next appointment will resolve the question that remains: what happens when two hurricanes hit. This entry was posted in News on 21/11/2010 by mirsinho.